Back to Teaching My Beginners and Intermediate/Advanced Courses. 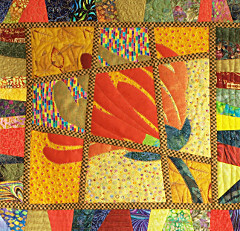 New Quilting Course for 2016. Now that Christmas is over and my students have ceased to be hostesses etc and have returned to the serious work of Patchwork and Quilting, we are back to our regular sessions at Talgai Hall. It’s lovely to see everyone again and the work is developing really well. 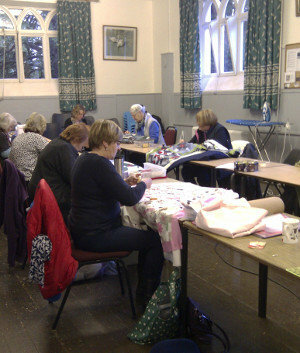 The Beginners nearly all have their quilts layered and some have started hand-quilting them. It is always a joy to see the finished tops as each one is totally individual and really lovely: I’ll put a photo of each one on the website when they are closer to being finished. I’m enjoying working on the project alongside them, so I’ll include my own quilt with the images. I have booked the dates for the next Beginners’ Course which will start on Thursday 8th September 2016 and run for twelve sessions. The dates, times and prices are now on the ‘Welcome’ page. If you think you’d like to do the Beginners’ Course, email or call me for a chat. The Intermediate/Advanced Group are working on Landscapes: they have chosen a photo of a landscape which is important to them in some way and to which they relate personally. They have used this image as a jumping off point to create a fractured image in textiles of their landscape. The group is made up of very highly skilled individuals now (though they would all blush at the thought!) and the results of their work so far are beautiful. When the work has developed further I will post images on the blog. I’m also working on landscapes, so I’ll post images of my work too. This entry was posted in Blog on 17 January, 2016 by admin.